Susan Young is currently an International Healer, Teacher, Lecturer, Geomancer. 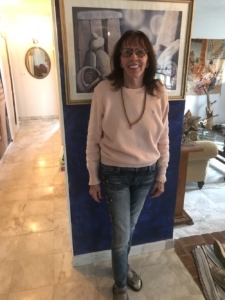 In the past she has worked as an International Reflexologist, Herbalist, Color Therapist, Nutritional Coordinator, Deeksha Giver, Family Life and Crises Assistant. She has been gifted since an early age to see and interact multi-dimensionally, with intuitive and psychic gifts. She has been called Guru by Gurus. Lamas call her Dakini and Saraswati, others call her Mystic. She thinks of herself as the one who works through the heart in service to the earth and people of the earth. An activist for the people to raise their frequency and consciousness. EEG Technician For Mercy Hospital Cols., Ohio and Part time Springfield Hospital. Dr .Ahmad Frau was a psychiatrist. I studied the brain working with him. Organizer Hands across America Organize people from Marysville to go. Director Women Against, with daughter 1 & 1/2 years. Worked in the Safe, Strong and Free program for children Columbus. Was sent to Cleveland to end abuse in 3 Developmental Centers. 1 & 1/2 yrs. Worked with early releases from prison while they were still in. State of Ohio Nutritional Coordinator 2 years. Visited 80 counties. Changed the Ohio State Constitution to make Housing a Public Purpose. Statewide organizer. Third time on the ballot. Deeksha Giver. 40 days in India learning Deeksha Amma and Sri Bhagavan. 40,000 Aura photos taken read and analyzed with practitioners different modalities, DO’s, Dr’s, Chiropractors etc. Made 45 Audio Acupuncture energy audio recordings, including energies of the elements of the periodic table. Long Distance Energy Healer who works on people, places in person or at any distance. Including Energy Clearings and Healings.